Can I retrieve deleted messages on WhatsApp? I've deleted a crucial message by mistake on WhatsApp. 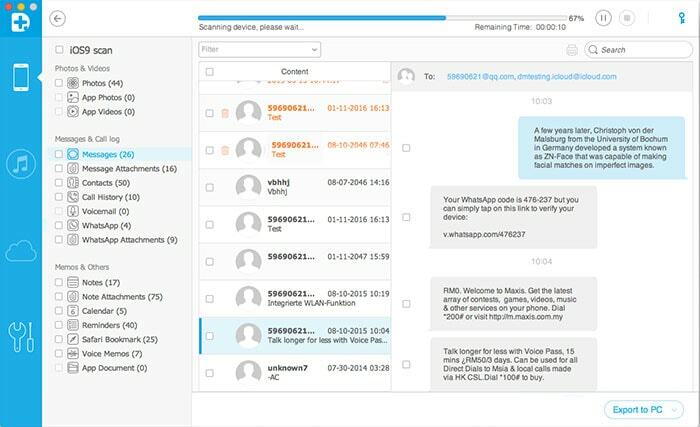 I retrieved deleted standard messages from my iPhone with a recovery tool before. My question is: Can I also retrieve WhatsApp messages deleted from iPhone? Since the emergence of WhatsApp, lots of people tend to communicate with friends and family through it, not only convenient, but also cheap. 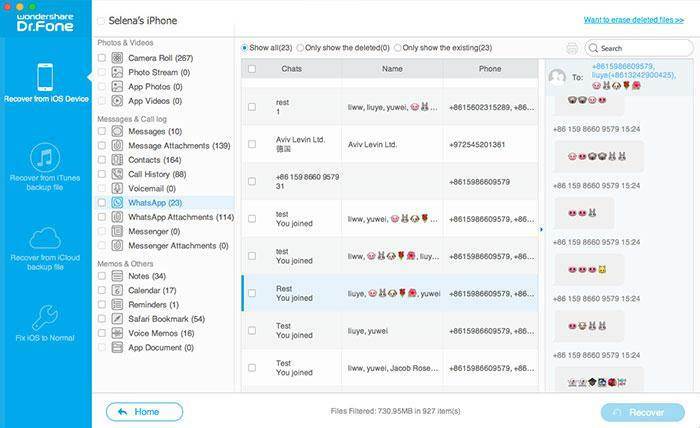 Just as the standard messages on the iPhone, you can also retrieve WhatsApp deleted messages from iPhone 5/4S/4/3GS, as long as you use a right recovery tool. 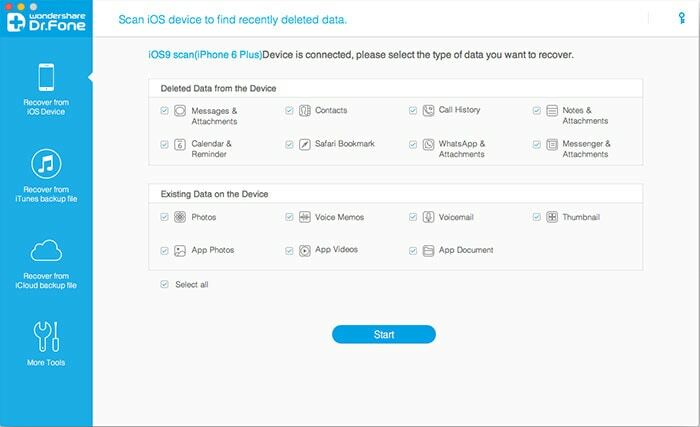 First of all, get an iPhone data recovery tool: Wondershare Dr.Fone for iOS (Mac). 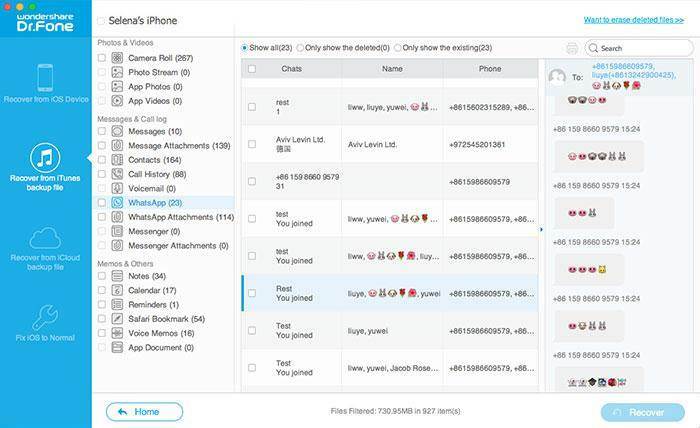 It can not only recover standard SMS from your iPhone, but also retrieve WhatsApp messages that you accidentally deleted. You can choose to recover WhatsApp messages by either scanning your iPhone or extracting iTunes backup, including message attachments. Next, let's try to recover WhatsApp deleted messages in two ways. You can follow the steps and do it with your own device on your computer. Before doing anything else, launch Wondershare Dr.Fone for iOS (Mac) on your computer. Then connect your iPhone. If you use iPhone 5 or iPhone 4S, the program's window will be shown as follows. If you use iPhone 4 or iPhone 3GS, the window will be a little different. It looks like below. Taking the iPhone in your hand, click Start on the window to begin. At the same time, tap the Power and Home buttons on your iPhone immediately for exactly 10 seconds..
Then release the Power button after 10 seconds, and still tap the Home button for another 15 seconds, until you get into the scanning mode successfully. 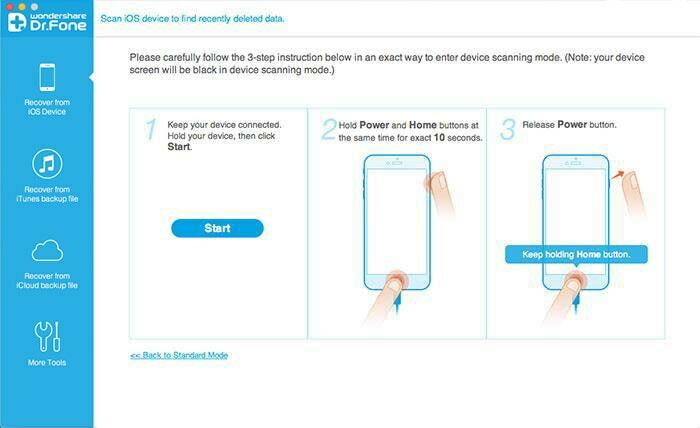 No matter you use iPhone 5 or iPhone 4, the scan will be shown as follows when the program begins doing it. If there are too much data on your iPhone, the scan will take you a little long time. After it, you'll get a scan result, where all found data on your iPhone will be displayed in categories. Click the WhatsApp category, you can read the whole messages including attachments and emoji before recovery. Tick off those you want and click Recover. You can save them all on your computer with one click. Note: Not only deleted WhatsApp messages, you can also export existing WhatsApp messages on your iPhone to the Mac, as long as you wish. Both deleted and existing WhatsApp messages have their own color. To use this way, you need to have ever synced your iPhone with iTunes before you lost the WhatsApp messages. Wondershare Dr.Fone for iOS (Mac) lets you preview your iTunes backup content and selectively export the data in it. Switch to Recover from iTunes Backup File after running the program, and you'll see the window below. There all iTunes backup on your computer will be automatically loaded and displayed. Choose the one for your iPhone and click Start Scan to extract all contents in it. The scan only takes you a few seconds. 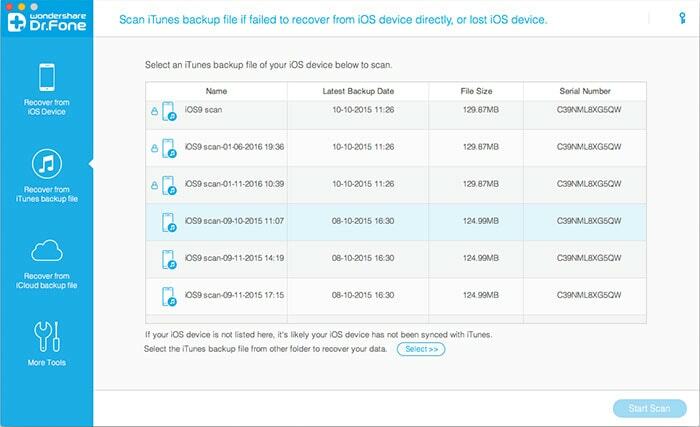 When it's over, you can preview all data in the iTunes backup file. Choose WhatsApp, and you can read all your WhatsApp messages in the backup in detail. Tick off the one you want back and click Recover to preserve it on your computer. You can also tick them all off and get them back with one click.